We are glad to announce our series of Orton-Gillingham workbooks is now available for through NYSTL funding! All our books follow O-G lesson plans and include fluency, visual and kinesthetic drills, sight word, controlled readers, and more! Log into your account at shopdoe.com. If you don’t have an account, make sure to “Sign Up” and activate it. Once you are in the store, use the search box to look for “MaxScholar” products. Select a title, or click “Search” to see all our products. 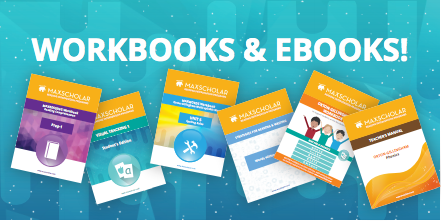 You will be able to see our full collection of workbooks and purchase them directly through the website with your NYSTL funding! Our workbooks follow research-based methods that can be found in our software, as well as other strategies that are taught through the workbooks themselves! If you want to get a description of what each workbook contains, feel free to go to the workbook store in our website. You will be able to download a sample before you decide to do the purchase via the DOE website! Select the workbooks and amounts you want to add them to your cart. Enter and review your details, then click on "Finalize Order Request." The order should then be on its way to your school!